Photograph by Robert McCabe from the exhibition ‟Chronography-An Exhibition for the 180th anniversary (1837-2017) of the Archaeological Society″. 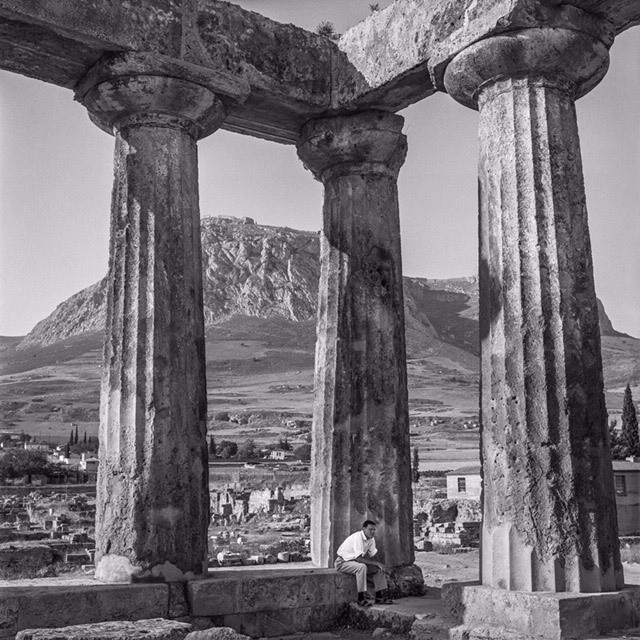 American photographer Robert McCabe fell in love with Greece the first time he visited it in the summer of 1954. People, monuments and landscapes made such a strong impact on the then 20-year-old Princeton student that he used every form of transport to reach the most inaccessible places in the country he has since returned to innumerable times. Today, he spends his life between New York and Athens, seeing himself as both American and Greek, as we were informed during the guided tour of the Robert McCabe tribute recently conducted for journalists in the building of the Archaeological Society, at 22 Panepistimiou St.
‟Chronography-An Exhibition for the 180th anniversary (1837-2017) of the Archaeological Society” opened in December to highlight the key role over the years of the Society as an institution decisive in shaping our self-awareness as a nation. The photographer himself also shares this belief. 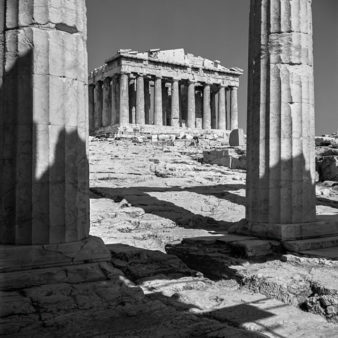 Thus, through this tribute which includes 53 black and white photographs from 1954 and 1955, places distinguished for their strong archaeological interest such as the Acropolis, the Ancient Agora, Sounion, Knossos, Santorini, Mycenae, Epidaurus, and Delos “welcome” visitors to a Greece which, on the one hand, remains unspoiled (the monuments have not changed apart from restoration work done on them) and on the other is almost unrecognizable, as the surroundings so often show. 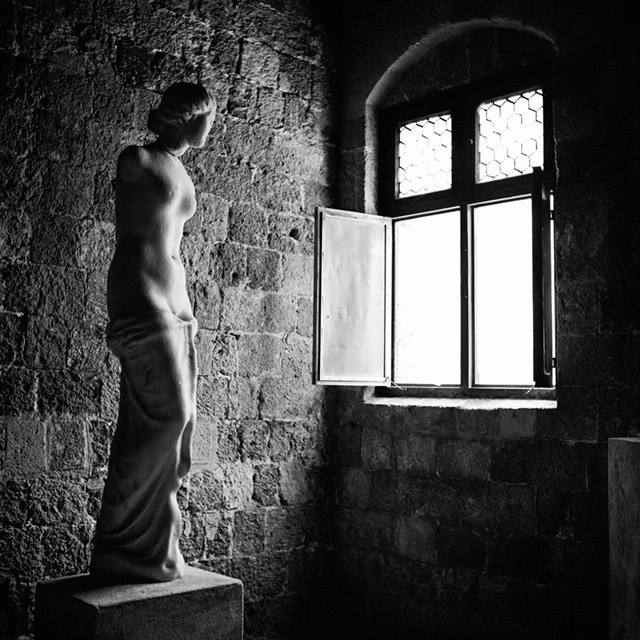 This is one of the many reasons it is worth visiting the exhibition, especially on the guided tours for the public by journalists Katerina Lymberopoulou and Margarita Pournara on two Saturdays, February 16 and March 9, 2019, at 11.30. The Archaeological Society at Athens will also conduct a guided tour for school students on Thursday, March 7. It should be noted that the exhibition, which is free, ends on March 29 (open from Monday to Friday, 10.00-18.00). The visitor is greeted by the only color photograph featuring in the exhibition. It was taken from Robert McCabe’s house in Plaka in December 2016 at dusk, ten minutes before sun set. ‟My wife and I waited for 45 minutes because the sky was completely overcast by clouds. The sun came out from time to time. I captured such a moment on camera about ten minutes before sunset. It is in the Pnyka which is one of our most frequent walks. I decided to leave it in color because it is my most recent photograph and may remain there after the exhibition. Such warm light cannot be captured in a black and white photograph”, McCabe told the two journalists who repeated this during the guided tour. 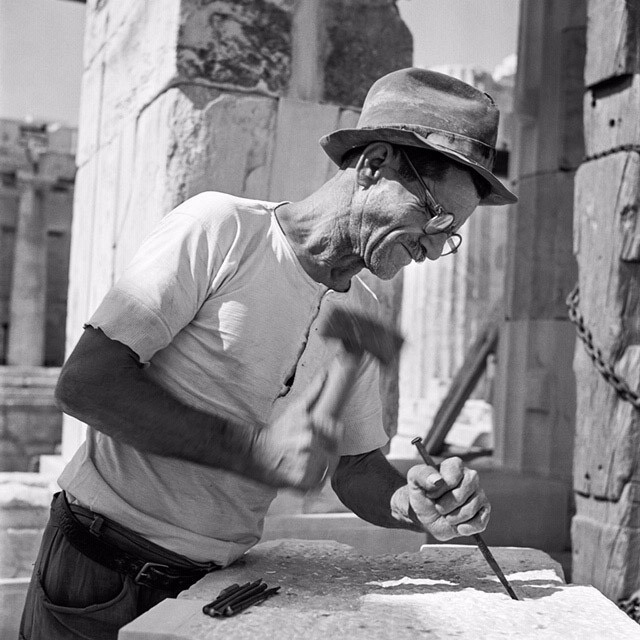 As for his first photograph from Santorini featuring on the exhibition’s poster, “It is taken in the early 1960s after the earthquake. This can be seen from the attempt to restore the monastery building in the photograph. Today this entire district is built up and the beach is full of umbrellas. It is a completely different picture. 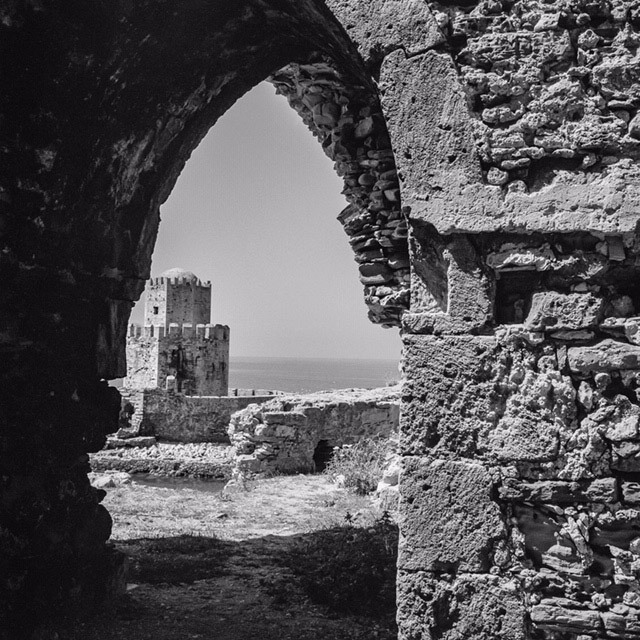 This photograph has been taken in Ancient Thera. You can see New Yorker Doctor Tany and our old friend and classmate Robert Dilon Cornick of French origin”, said R. McCabe about the picture of two men sitting on the end of a wall possibly belonging to the monastery being restored, while spread out below is a completely unbuilt Perissa. Mycenae takes up a large section of the exhibition. 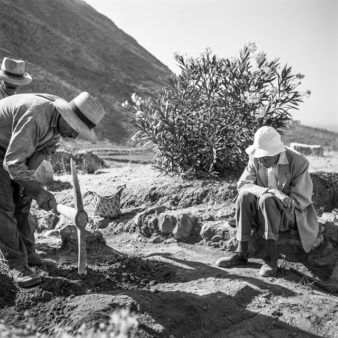 It is also interesting to hear what McCabe has to say to the two journalists about photographing Grave Circle A, which could not be done today by a visitor. ‟Patrick Lee Fermor’s wife Joan, who was a photographer, had taken the same photograph from the same angle. She had done it before I went. Many of our photographs are identical and I discovered this at the recent exhibition in the Benaki museum. I had met them as a couple and had gone once or twice to their house in Kardamyli. At the time I did not know she was a photographer. I realized she must have been there before me because some stones I had photographed had not yet been put in their current place. Today nobody can climb up so as to be able to take such shots”.